This weekend, hubby Rob and I celebrated our first wedding anniversary! It's hard to believe it has already been a year since I donned my wedding dress and we walked down the aisle. 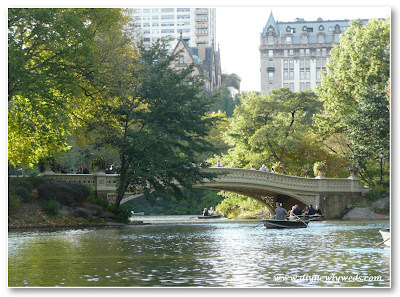 To celebrate, Rob and I headed to New York City for the day to have dinner and take a stroll through Central Park. 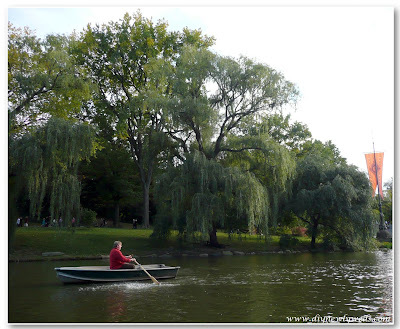 We even took a romantic boat ride on the lake in Central Park which was my favorite part of the day. The park looks so gorgeous from the water. The next day we celebrated our first wedding anniversary with an anniversary party with our families. We had lots of dessert and broke out our year-old wedding cake which I was very excited to eat since I only had one bite of it during the wedding. To decorate for our anniversary party, I set up the dining room table with special mementos from the wedding. 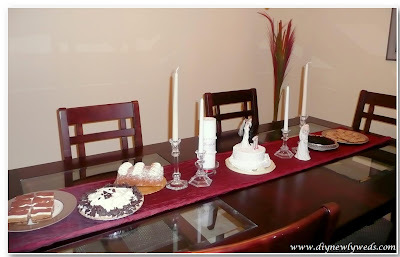 I added a red table runner, our wedding color, and decorated with our unity candle, another set of pretty crystal candle-holders which were a wedding gift, and a bride figure Rob gave to me when we got engaged. 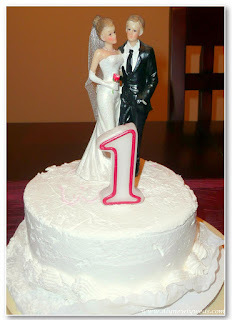 And of course we displayed our wedding cake, complete with our cake topper and a "1" candle for us to blow out! We had a wonderful anniversary and I have no intention to stop calling us newlyweds! Happy 1st Anniversary! we took a trip to Nashville Opryland Hotel! and got a couples massage!! Happy Anniversary. We took a mini vacation to Madison, Wisconsin and relaxed. It was fun! We didn't have much money at the time, due to some unexpected house problems, BUT... we went to dinner at a nice restaraunt in a nearby city and actually spent most of the day arguing. I'll be honest... we were like cats & dogs then. Don't remember why (of course), but I'm sure it was petty and stupid. Makes for a good laugh now, though. I'm sure our 2nd will be MUCH better (coming up enxt month!). Our 1st anniversary was just two months after we moved into our new house. So we threw a housewarming/anniversary party. We had a Luau theme, complete with grass skirts and leis. We even gave everyone name tags with Hawaiian names. Lots of fun! And the year old cake tasted pretty good!